What is an abdominal aortic aneurysm (AAA)? It is a balloon-like bulge in a major blood vessel, the aorta. The bulge forms at a weak spot in the vessel wall. An abdominal aortic aneurysm is dangerous because it can rupture. This is serious and can be fatal, but now that you know you have an abdominal aortic aneurysm, steps can be taken to treat the problem and prevent rupture. An abdominal aortic aneurysm is a “silent” problem because it usually causes no symptoms. It is sometimes found by a healthcare provider during a routine exam, but more often, it is found when tests are done for an unrelated problem. Once an abdominal aortic aneurysm is found, tests can be done to measure the size of the aneurysm and follow its growth. Having a close relative (parent, brother, or sister) who has had an abdominal aortic aneurysm. Having blood vessel disease in other parts of your body. Being over age 55 if you are a man and 65 if you are a woman. 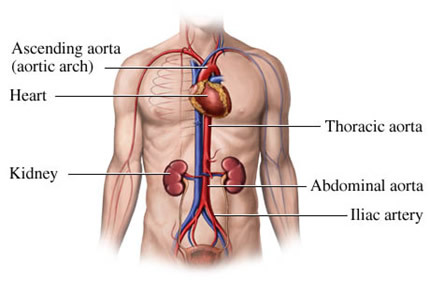 The location of your abdominal aortic aneurysm. The shape of your abdominal aortic aneurysm. The size of your abdominal aortic aneurysm. The condition of your blood vessels. Blood vessels are tubes that carry blood throughout your body. Arteries (red) carry oxygen-rich blood from the heart to the rest of your body. Blood vessels that carry blood back to your heart are called veins (blue). 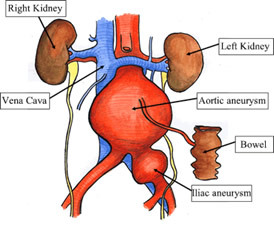 An abdominal aortic aneurysm occurs when a part of the largest artery in the body, the aorta, weakens and expands. The aorta is the artery that carries blood directly from the heart. Blood then flows from the aorta into smaller arteries that supply the rest of the body. A healthy artery is smooth on the inside, which allows blood to flow easily. The part of the aorta that travels through the abdomen (stomach area) is called the abdominal aorta. Smaller arteries branch of the abdominal aorta to carry blood to organs in the abdomen. These include the renal arteries, which supply the kidneys. Lower down, the aorta divides into two iliac arteries, which supply blood to the legs. The problem begins when the lining of the aorta is damaged or the aorta may become weakened due to certain factors that run in families. The weakened artery stretches outward, expanding like a balloon. The resulting bulge is called an aneurysm (see below). As it expands, the artery wall becomes thinner and weakens even more. High blood pressure (hypertension) further strains the artery wall. It may become so thin that it ruptures (leaks, bursts, or tears open). This is fatal if not treated right away. If you have an abdominal aortic aneurysm, it is possible that you have disease in other arteries. If so, you are at risk of a heart attack, stroke, and vascular problems in the legs and other parts of your body. Your doctor may recommend that you be screened for these conditions. Brain: If the arteries supplying the brain are blocked, you may suffer a stroke. Heart: A blockage in an artery supplying the heart muscle can cause a heart attack. Kidneys: Clogged renal arteries can cause kidney problems. Legs: A blockage in a leg causes a painful condition called peripheral arterial disease. An examination and tests give your doctor more information about your abdominal aortic aneurysm. Certain tests measure the size of the aneurysm. They can track changes in your abdominal aortic aneurysm over time. Other tests assess blood flow. They may be completed if it is decided that you need surgery. History & Physical Exam: After an examination of your abdomen, you will be asked about your family history. Your doctor will also ask you about your health history. Contrast fluids used for tests may contain iodine, so you will be asked about your allergies, including iodine and/or seafood. Ultrasound. Sound waves are used to create an image of the blood vessels. For this test, a technician moves the sensor across your abdomen. CT (computed tomography). A series of x‑rays are taken with a special x‑ray machine. Computers then use these x‑rays to create a picture of your aneurysm. Before this test, you may be given contrast fluid through an intravenous. This helps arteries show up clearly. MRI (magnetic resonance imaging). This makes images by analyzing energy released by tissues in the body after exposure to a strong magnet. A different type of contrast is used for this test. Other tests, which may be done prior to repair of the artery, include an arterial Doppler study. Blood flow in the legs is measured with a probe and blood pressure cuffs are placed on the legs. Arteriography creates an x‑ray image (arteriogram) showing the blood flow through the aorta and other arteries. Contrast fluid is used for this test. Treatment options for you depend on many factors, for example: How big is the aneurysm, is it growing and, if so, how quickly, and how is your overall health? Considering these and other factors can help you weigh the risks and benefits of each type of treatment option. Then, you and your doctor can decide what to do. Before making any decision, be sure that all of your questions are answered. Regular monitoring. You will have imaging tests at least once a year to track your risk of rupture. If the aneurysm reaches a certain size or is growing rapidly, repair may be needed. Reducing the risk of rupture. Controlling factors such as blood pressure may make your abdominal aortic aneurysm less likely to grow or rupture. It can also improve the health of your arteries. This helps you prepare for surgery, if it becomes necessary. Being alert for symptoms of rupture. These symptoms include severe back pain and/or tenderness in your stomach area. You may also feel light-headed, dizzy, or even faint. If you notice these changes, call 911, right away. A ruptured abdominal aortic aneurysm is an emergency. Considering surgery. If an aneurysm is large or growing rapidly, the risk that it will rupture may outweigh the risks of a procedure to repair the artery. If so, you will be advised to consider surgical repair. There are two basic ways to repair the artery: Endovascular repair and open surgery. Which type of repair is best for you depends on many factors. You may even have a choice between the two. An abdominal aortic aneurysm can be repaired with endovascular repair or open surgery. Both methods involve placing an artificial graft inside the damaged artery. Each procedure has its risks and benefits that you should discuss with your doctor. Endovascular repair. For this procedure, very small incisions are made in the groin. The graft is inserted into an artery through an incision and guided to the aneurysm. The procedure often has a short recovery period, which allows for a quick return to normal activities. This repair is new compared to an open repair. Close follow‑up is needed, even if you feel fine. Be aware that in some cases, the size and shape of a person’s blood vessels rule out endovascular repair. Have tests as advised by your doctor. Tell your doctor about any medications, herbs, or supplements you are taking. Your doctor may advise you to make certain changes before surgery. Arrange to take a week off of work. Pack a bag for a hospital stay of 1 to 3 days. Do not eat or drink after the midnight before your procedure. Injuries to the blood vessels used for access and to other nearby blood vessels. A leak around or behind an endovascular graft. Blood clot on or in the graft. Heart attack, stroke, or death. Open surgery: For this procedure, a single large incision is made in the abdomen. 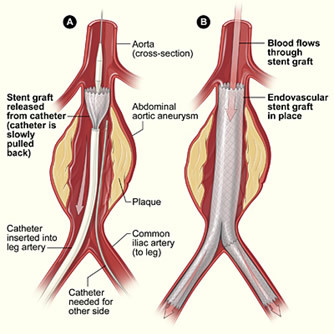 The graft is then sewn into the artery above and below the aneurysm. Open surgery involves a longer recovery than an endovascular repair, but for some people, open surgery may be the only way to repair the aorta. Open surgery has been used for many years and has a good long‑term track record. It may be recommended for younger people to ensure that the graft lasts over time. Stop taking aspirin and ibuprofen as directed. Tell your doctor of any medications, herbs, or supplements that you are taking. Your doctor may advise you to stop taking some of them before surgery. Arrange to take time off of work. Plan for recovery to take 6 weeks or more. Pack for a hospital stay of 7 to 10 days. Heart attack or other hearth problems. Pneumonia or other pulmonary problems. Injury to the blood supply of the colon or spinal cord. Impaired sexual function in men. Infection or blood clot at the graft. Endovascular Repair: In this procedure, a graft made of wire mesh and fabric is placed inside the abdominal aorta. This takes pressure off the weak artery wall. Recovery often takes a week or less. Imaging tests then track the condition of the graft over time. At the hospital, you will be asked to fill out certain forms. You will then be taken to a prep room where you will change into a hospital gown. At this time, you will discuss your anesthesia (medication to keep you pain-free during surgery) with a doctor or a nurse. These options may include medication to keep you relaxed, to block pain, or to make you sleep. An intravenous line will be started to give you medications and fluids. The skin where the catheter will be inserted may be shaved. You will be taken to the room where the procedure will be done. Once there, you will lie on a table beneath x‑ray cameras. These cameras are used to help place the graft. Two small incisions are made in the groin. A catheter, a thin, flexible tube, is threaded through an artery at each incision. The collapsed graft is placed inside one of the catheters. X‑rays are used to help your surgeon move the graft through the arteries towards the damaged part of the aorta. The catheters are used to then place the graft in position. Once the graft is in position, your surgeon expands it. Metal springs or hooks hold it in place above and below the aneurysm. The catheters are then removed. Once your procedure is complete, your surgeon may do some tests to check the graft. The incisions in your groin are then closed and you are returned to your room. You can expect to stay in the hospital for 1 to 3 days. You will be closely monitored during this time. Your urinary catheter (tube to drain urine) and intravenous line may remain in place until shortly before you are discharged. Your surgeon will likely allow you to go home once you are alert, your pain is under control, and you are able to eat and digest food. A family member or an adult friend will need to drive you home. Take your medications as directed once you are home. Be as active as you can be. You will most likely feel back to normal in a few days. After your endovascular repair, you will need follow‑up tests often. Your first follow‑up will be about a week after your procedure. Imaging tests will be done to check the graft. In most cases, imaging studies are needed every 3 to 6 months for the first 2 years. After that, you will most likely have yearly tests. If there is a problem with the graft, further endovascular repair or open surgery may be required. Swelling or bleeding at the insertion site. Temperature of 100° or higher. Change in the temperature or color of your feet or legs. Pain in the lower back or stomach areas. Open Repair: During open surgery, the weakened wall of the abdominal aorta is replaced with a graft made of a strong, flexible fabric. This allows blood to flow safely through the aorta to the lower body. After surgery, you will be cared for in the hospital for several days. Anesthesia will be given to you just before surgery begins. General anesthesia is used to make you sleep and keep your muscles relaxed during your surgery. You may also be given pain medication through a thin, soft tube inserted into your spine, called an epidural. Surgery begins with an incision made into your abdomen. Two possible positions for the incision are listed above. The dotted line incision may continue around the side of your abdomen. The size and shape may vary. Your surgeon gently moves aside your organs to reach the aorta, which is then clamped to stop blood flow. Your surgeon then opens the aneurysm and clears any blood clot. The graft is sewn to the aorta above and below the aneurysm. Some of the aorta wall may be removed. This helps make a snug fit when the aorta is wrapped around the graft. The aorta is then sewn together helping to protect the graft. The incision site is then closed. After your surgery, you will be taken to the ICU (intensive care unit). Your vitals, including blood pressure, pulse, and breathing, will be checked. You will be given pain medication as needed. If you were given an epidural, it may stay in place to help control the pain. A catheter to drain urine. A tube that is passed through the nose and into your stomach (nasogastric tube). A tube to help you breathe. If you have this, it may prevent you from talking. While in your hospital room, you will be checked often to make sure you are healing well. Your IV line will remain in place. You will be assisted with walking as soon as possible. As you gain strength, you will walk farther and be up for longer periods of time. Pain control medication may be given through a pump that lets you control the dose, within the limits set by your surgeon. Breathing exercises will help prevent lung infection. For this, you will use a spirometer that helps you practice taking deep breaths. Before you are discharged from the hospital, you will meet with your surgeon. Your surgeon will go over the results of your surgery and give you instructions for home recovery. You will most likely be cleared by your surgeon to go home when you are alert, your pain is controlled, and you can eat and digest food. Your recovery will not happen overnight. You may be recovered as soon as 4 weeks after leaving the hospital or it can take a few months. Try to be active, but be sensible. If what you are doing hurts, stop. If you are tired, rest. Follow the instructions your surgeon gave you on caring for yourself at home. Ask a family member or friend to help with your daily tasks, including shopping, cooking, and other chores. Your appetite and digestion may not be normal at first. If so, try soups and other liquids. You may also be prescribed a mild laxative. Take a shower instead of a bath for the first week. Avoid strenuous exercise and do not lift anything that weighs over 10 pounds. Do not drive until your surgeon tells you that you can. Keep all follow‑up appointments with your surgeon. Even if you are back to your normal routine/activities, you may have less energy than usual. This may last 2 to 3 months, or even longer. As long as you do not over exert yourself, exercising can help you get back to your full strength, so be as active as you are able to. Discuss any ongoing concerns with your surgeon. A very red, very tender, or draining incision. Pain in your legs, abdomen, or back. Quit smoking, which raises blood pressure and makes blood clots more likely. If necessary, get medical help and quit for good. An eating plan based on vegetables, fruits, whole grains, and low-fat dairy products can help lower your blood pressure. Reducing salt intake also helps. Daily exercise can lower your risk of artery problems. Start gradually and work up to 30 minutes most days of the week. If you are overweight, losing as little as 5 to 10 pounds can improve our health. Set a goal that you know you can reach. Take your medications as prescribed. When used correctly, medications can help control your blood pressure. Set up a routine so you will not miss any doses. Diabetes is a disease that raises the level of glucose (sugar) in your blood. This damages arteries and worsens artery disease. Controlling blood sugar levels can reduce damage. Control includes exercise, watching what you eat, and monitoring your blood sugar daily. Many people with diabetes must also take medications or insulin. Talk to your healthcare provider about your treatment options. A dietician or certified diabetes educator may be recommended to help improve your blood sugar control. You learned about your abdominal aortic aneurysm in time to do something about it. Abdominal aortic aneurysms run in families, which means that your brothers, sisters, and/or children could be at risk. Screening could save the life of someone you love. Urge your family members to ask their healthcare providers about screening for abdominal aortic aneurysms.